Orthographic projection centred over the Îles Crozet. The Crozet Islands (French: Îles Crozet; or, officially, Archipel Crozet) are a sub-antarctic archipelago of small islands in the southern Indian Ocean. They form one of the five administrative districts of the French Southern and Antarctic Lands. In the early 19th century, the islands were often visited by sealers, to the extent that the seals had been nearly exterminated by 1835. Between 1804 and 1911, 153 vessels visited the island for seals, seven of which wrecked on the coast. Subsequently, whaling was the main activity around the islands, especially by the whalers from Massachusetts. In 1841 there were a dozen whaleships around the islands. Within a couple of years this had increased to twenty from the United States alone. Such exploitation was short-lived, and the islands were rarely visited for the rest of the century. Shipwrecks occurred frequently at the Crozet Islands. The British sealer, Princess of Wales, sank in 1821, and the survivors spent two years on the islands. The Strathmore was wrecked in 1875. In 1887, the French Tamaris was wrecked and her crew stranded on Île des Cochons. They tied a note to the leg of an albatross, which was found seven months later in Fremantle, but the crew was never recovered. Because shipwrecks around the islands were so common, for some time the Royal Navy dispatched a ship every few years to look for stranded survivors. The steamship Australasian also checked for survivors en route to Australia. Between 1924 and 1955, France administered the islands as a dependency of Madagascar. Crozet Islands became part of the French Southern Territories in 1955. In 1938, the Crozet Islands were declared a nature reserve. In 1961, a first research station was set up, but it was not until 1963 that the permanent station Alfred Faure opened at Port Alfred on Île de la Possession (both named after the first leader of the station). The station is staffed by 18 to 30 people (depending on the season) and does meteorological, biological, and geological research, maintains a seismograph and a geomagnetic observatory (IAGA code: CZT). The Comprehensive Nuclear Test Ban Treaty Organization ( CTBTO ) has listening equipment on the island after the CTBTO disclosed that two of its stations, the other being on Ascension Island, detected what is believed to be an underwater, non-nuclear explosion off the coast of Argentina and believed to be a fatal accident of the ARA San Juan submarine in 2017. The islands lie on the Antarctic Plate roughly between the Kerguelen hotspot and Madagascar and southern Africa. The oldest East Island formed roughly 9 million years ago from a hotspot which has continued forming islands to the west until, ostensibly, the present. Despite this apparently young age, no volcanic activity has been observed to date on any of the islands. (1) Group of two major islands (Grande Île—Big Island, and Petite Île—Little Island) and about 20 pinnacle rocks. The Crozet Islands are uninhabited, except for the research station Alfred Faure (Port Alfred) on the East side of Île de la Possession, which has been continuously manned since 1963. Previous scientific stations included La Grande Manchotière and La Petite Manchotière. The Crozet islands have a maritime-influenced tundra climate (Köppen climate classification, ET). Monthly temperatures average around 2.9 °C (37 °F) and 7.9 °C (46 °F) in winter and summer respectively. Precipitation is high, with over 2,000 mm (78.7 in) per year. It rains on average 300 days a year, and winds exceeding 100 km/h (60 mph) occur on 100 days a year. The temperatures may rise to 18 °C (64.4 °F) in summer and rarely go below −5 °C (23 °F) even in winter. 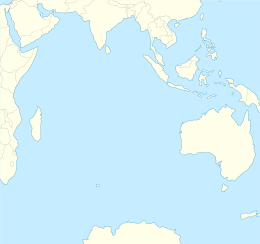 The islands are part of the Southern Indian Ocean Islands tundra ecoregion that includes several subantarctic islands. In this cold climate plant life is mainly limited to grasses, mosses and lichens, while the main animals are insects along with large populations of seabirds, seals and penguins. The Crozet Islands are home to four species of penguins. Most abundant are the macaroni penguin, of which some 2 million pairs breed on the islands, and the king penguin, home to 700,000 breeding pairs; half the world's population. The eastern rockhopper penguin also can be found, and there is a small colony of gentoo penguins. There is also an endemic subspecies of the duck Eaton's pintail. Other birds include black-faced sheathbills, petrels, and albatross, including the wandering albatross. Mammals living on the Crozet Islands include fur seals, and southern elephant seals. Killer whales have been observed preying upon the seals. The transient killer whales of the Crozet Islands are famous for intentionally beaching (and later un-stranding) themselves while actively hunting the islands' breeding seal population. This is a very rare behaviour, most often seen in the Patagonia region of Argentina, and is thought to be a learned skill passed down through generations of individual orca families. These killer whales also seem to stay around the Crozet Islands year-round, feeding on mostly seals during the summer, and then feeding on penguins for the winter. The Crozet Islands have been a nature reserve since 1938. Introduction of foreign species (mice, rats, and subsequently cats for pest control) has caused severe damage to the original ecosystem. The pigs that had been introduced on Île des Cochons and the goats brought to Île de la Possession—both as a food resource—have been exterminated. Another on-going concern is overfishing of the Patagonian toothfish, as well as the albatross population, which is being monitored. The waters of the Crozet Islands are patrolled by the French government. A 2012 French film, Les Saveurs du Palais, begins and ends with scenes in the Crozet Islands. The film's protagonist, a grandmotherly chef from the Périgord region of France who signed on as cook for the research station, had once been the personal chef to President François Mitterrand. In the 1978 novel Desolation Island, the fifth book in Patrick O'Brian's Aubrey–Maturin series, the fictional frigate HMS Leopard is severely damaged by a collision with an iceberg in the southwestern Indian Ocean. The crew attempts to make landfall for repairs on one of the Crozet Islands, but they miss the island and continue to drift towards the east, unable to reverse direction. The Marion Dufresne off the "port" of Crozet. East Island in the background. Crozet Islands causing a Von Karman Vortex street to form under low clouds. ^ a b c Mills, William J (2003). Exploring Polar Frontiers: A Historical Encyclopedia, Volume 1. ABC-CLIO. pp. 166–167. Retrieved 26 September 2016. ^ a b Hough, Richard (1995). Captain James Cook: A Biography. W. W. Norton & Company. pp. 259–260. ISBN 978-0393315196. ^ R.K. Headland, Historical Antarctic Sealing Industry, Scott Polar Research Institute, University of Cambridge, 2018, p.166. ^ "THE CROZET ISLANDS". The Express And Telegraph. XXVI, (7, 584). South Australia. 21 March 1889. p. 3 (Second Edition.). Retrieved 4 May 2016 – via National Library of Australia. ^ "'Explosion' dashes sub crew survival hopes". 23 November 2017 – via www.bbc.com. ^ Quilty, Patrick G. (2007). "ORIGIN AND EVOLUTION OF THE SUB-ANTARCTIC ISLANDS: THE FOUNDATION" (PDF). Papers and Proceedings of the Royal Society of Tasmania. 141 (1). Retrieved 25 March 2019. ^ a b "Southern Indian Ocean Islands tundra". Terrestrial Ecoregions. World Wildlife Fund. Retrieved 2012-01-10. ^ "Moyennes 1981/2010: France (Terres Australes)" (in French). Météoclimat. Retrieved June 14, 2015. ^ "STATION Alfred Faure" (in French). Météoclimat. Retrieved June 14, 2015. ^ Bost, Charles-André (31 October 2015). "King penquins face longer commute". New Scientist. 228 (3045): 17. Wikimedia Commons has media related to Crozet Islands. This page was last edited on 25 March 2019, at 06:32 (UTC).